Comments: The Star Wars battle rages on! The Rebels and light side of the Force clash against the Empire and the dark side of the Force in this awesome battlepack. WHo will win? The fate of the galaxy is in your hands! General Veers: The stern and polished General Maximillian Veers is completely loyal to the Empire. He launches an invasion to destroy the Rebels' shield generator protecting the base from attack. Snowtroopers: Imperial snowtroopers are specially trained to fight in cold climates. They arrive on the ice planet Hoth to attack the Rebels' base and meet heavy resistance from the heroic Rebels. Probot: Probots are deployed to gather and send data to the Empire. One of these relentless hunters finds the Rebels' hidden base on the planet Hoth and transmits the information to Imperial forces. Imperial forces attack the Rebel Alliance’s Echo Base on Hoth’s icy surface in this exciting Battle Pack. 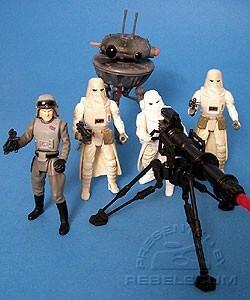 Includes General Veers, a Probot and three Snowtroopers. The Assault on Hoth contains members of the Blizzard Force assault squad from The Empire Strikes Back. The back of the box incorrectly shows the vintage AT-AT Commander figure, although he is not included in this set. General Veers is a slight repaint of the AT-AT Commander figure from 1997's POTF2 Imperial AT-AT Walker. he also comes with a blaster this time around. The 2 Snowtroopers are slight repaints of 1997's POTF2 Snowtrooper. This time it's a bit dirtier. Snowtrooper Officer is a straight repack of 2004's OTC Snowtrooper, which was a slight repaint of 2003's SAGA Snowtrooper (The Battle of Hoth). It still comes with an E-WEB Repeating Blaster, but the BlasTech E-11 Blaster Pistol is not included. Probot is a slight repaint of 1997's POTF2 Deluxe Probe Droid. This time around it's a bit dirtier, and the dangling legs have been assembled out of order, at least on this sample.